Are you ready to start ordering your wedding invitations? Should you go to a dealer or order your wedding invitations online? Where can you buy cheap invitations? Should you consider making your own invitations? Will you save money doing your own invitations or will ordering them be less expensive? Are you familiar with wedding invitation etiquette? Do you know when to send the invitations out, what wording to choose and how to address them? These are just a few questions you need to consider when it comes to choosing and ordering your invitations from a dealer or ordering online wedding invitations. Or From A Local Dealer? A wedding invitation dealer can be found in your local community or online. You can find local dealers most often at print shops, bridal shops, greeting card shops or use a graphic designer. Look in the phone book or do a search online for local dealers. The benefit of local dealers is that you can look at invitation books and actually see and feel the invitations. Also some dealers will guide you through the ordering process. Who can you order from locally? Print shops in particular carry books from many wedding invitation companies to give you more options to find what you want. Some will allow you to take the books home for a few days, which makes it convenient for you to let others see them. 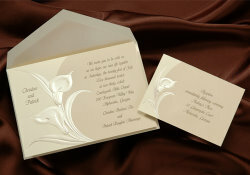 Some dealers will give you a discount on your wedding invitation order. And if there is a problem with your invitations the dealer will handle it for you. You also will get invitations delivered with in a few days to a week in most cases. The biggest benefit of ordering online wedding invitations is the convenience! You can do it from anywhere you can find a computer. Another benefit is that some companies offer deep discounts for doing it online, since you are doing the work yourself. Order your wedding invitations online if you are the type that doesn't need help with the order process and can figure out the etiquette, wording and insert choices needed. Some brides like to see what an invitation looks like to get a good idea of the colors, size and the quality of the papers. If you are this type, then looking at the books at local dealers will be your best way to order. When ordering online wedding invitations you can request a sample of the invitation you want to order before it is sent to print, for a small fee. There are some dealers who have in house service as well as online ordering capabilities. Some will personally assist you through the process if you want help to do so online. Or if you do it on your own, they will confirm your online order with you to make sure everything is correct before placing it. This service gives you the best of both worlds! When you start your wedding planning, one of the things you will do is to start making a guest list. You will list every person, including adults and children, who you want to invite. Make sure you include your fiance's guest. Check and double check to make sure you include all you want to invite. Why am I emphasizing this? 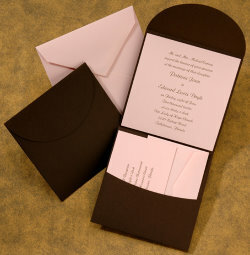 Because it will be costly to order more invitations after the initial order. So make sure you have a complete final guest list before ordering your wedding invitations. Now when ordering online wedding invitations or ordering locally some make the mistake of ordering way too many invitations. What caused this? They used the total count on the guest list for the order.For instance, if they had 100 guests, they ordered 100 invitations. What they forgot was that multiple guest lived in the same household. They forgot that they only needed to send1 invitation, in most instances, to a family. If there are other adults living in the household, like adult children, then you need to send them a separate invitation. So what you have to do is break your guest list down into those who are single, and those who belong in family groups. You will now have a count of how many invitations to send out. Now start gathering addresses for those on your guest list. When should you let your family and friends know of your wedding plans? As soon as possible! Most of the time as soon as a person gets engaged and you choose a date, people start to pass the news by word of mouth. But what a lot of couples are doing is they are sending out save the date invitations or magnets. Here are some save the date etiquette tips to get you started! What Is The Etiquette For Wedding Invitations? 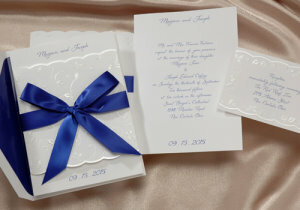 Before ordering online wedding invitations you should get answers to some faq about wedding invitations etiquette. Some of the questions that will be answered are pertaining to what to order, when to order, and how to assemble and mail out your invitations. Also read the money saving tips you can use for ordering and mailing your invitations. 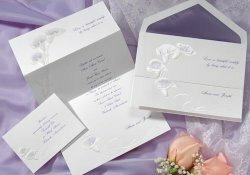 Birchcraft online special for July 2011: Get free lined envelopes plus %20 off retail prices on invitation order! How Do You You Assemble Wedding Invitations? 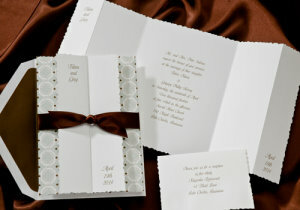 There is a way that wedding invitation etiquette suggest you follow for wedding invitation assembly. How are you suppose to stuff the enclosures, such as the reception card, respond card, maps and even the tissue paper in the invitation envelope? Should I use send n seal invitations for my wedding? Good question! Some brides should and some shouldn't. Find out whether these invites can be helpful to you!